This project involves the construction of a one tube audio amplifier built around a common 6U8A triode/pentode tube. It is suitable for use as a radio's audio output stage, two of these amps would make a great speaker amplifier for an MP3 player or a headphone amp. The peak output power is around 100 milliwatts. This amp is extremely simple, it would make an excellent first project for someone who wants to learn about vacuum tubes. Several other common tubes such as the 6EA8 and 6GH8 may be substitued for the 6U8A, these tubes share the same pinouts but have different gain characteristics. This project uses high voltages including 120VAC and 250VDC. The project should only be taken on by someone who has experience working with high voltage circuitry. The power supply should always be disconnected and the B+ line should be shorted to ground when working on the amp. The line-level audio signal is sent through a 100K audio volume control and into the grid of the 6U8A triode section. The triode is wired as a standard class-A tube amplifier. The B+ line to the triode is isolated from the final amplifier's B+ through a 5.5K/22uF low pass filter, this prevents interstage feedback and oscillation. The output of the triode amp is sent to the control grid of the 6U8A pentode section through a 10nF capacitor. The pentode is wired as a class-A amplifier with a transformer output. A negative feedback loop linearizes the amplifier's frequency response, this consists of a 120K resistor and 470pF capacitor from the speaker side of the output transformer to the cathode of the 6U8A triode. Feedback is kept to a fairly light level to preserve the amp's dynamics. The R/C network across the output transformer primary was adjusted for a flat frequency response. The pentode's screen grid is pulled up to the B+ voltage through a 1.5K current limiting resistor and is AC-bypassed with a 10nF capacitor. If a tone control is desired, it can be built onto the feedback loop, see my Squirrel Monkey amp project for an example of this type of tone control. If you build the amplfier and it oscillates, swap the output leads on the output transformer to correctly phase the feedback signal. 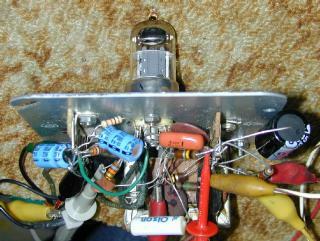 The power supply is not shown, this amp is designed to be an audio module that can be combined with other modules to build a radio or other audio devices. Any standard vacuum tube power supply should work here, it just needs to provide 6.3VAC for the filament and 250VDC for the B+ circuit. The amp should work fine with B+ values between 150VDC and 300VDC. Again, see my Squirrel Monkey amplifier for a power supply that will work with this amplifier. The amplifier was built onto a standard 4"x4" electrical utility box cover plate. The plate was the type with a conduit knockout in the center. The knockout was removed and two small holes were drilled on either side to hold the 9 pin tube socket. Three more 5/32" holes were drilled around the perimeter of the tube socket to hold the terminal strips. Holes were drilled for mounting the transformer. The various resistors and capacitors were connected between the tube socket and terminal strip pins. Standard Romex style cable clamps were used on the power supply box for securing the power input and output wires. 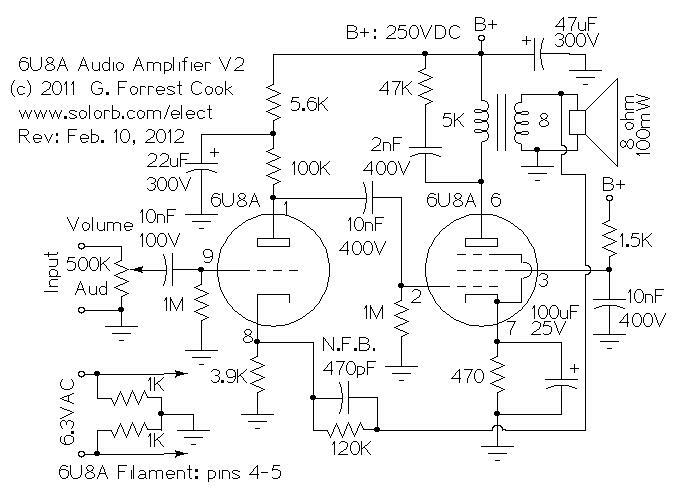 Connect an 8 ohm speaker to the amp and plug an audio source into the input. Apply power and turn the volume control up to the desired listening level. 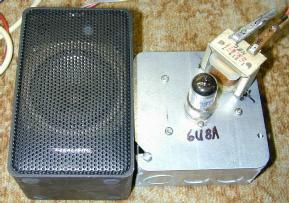 With a selected 6U8A tube, this simple design can produce very little hiss. Since the amp only uses one tube, it makes a good test platform for comparing the hiss and microphonics levels of different tubes. This amp was put to use in my House Finch Direct Conversion Tube Receiver project, an extra 6C4 triode preamp stage was added to increase the gain. That version of the amp was then split off of the receiver project to become the Low Power 6U8A Vacuum Tube Audio Amp V3.